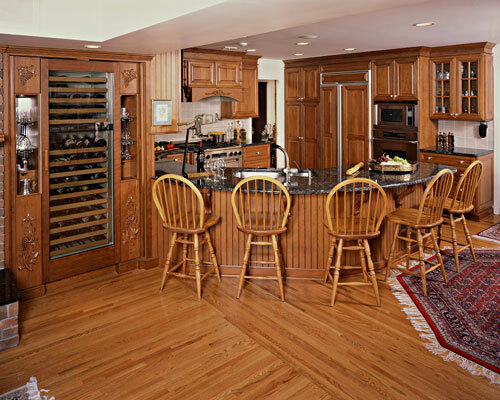 This kitchen was designed by John Lang and features Jay Rambo cabinetry, a custom wine cabinet inspired by the wine collector, Blue Pearl Granite countertops, and custom lighting! Stop by our Newtown-based kitchen and bath showroom for assistance from a team of experienced and professional kitchen and bath designers! 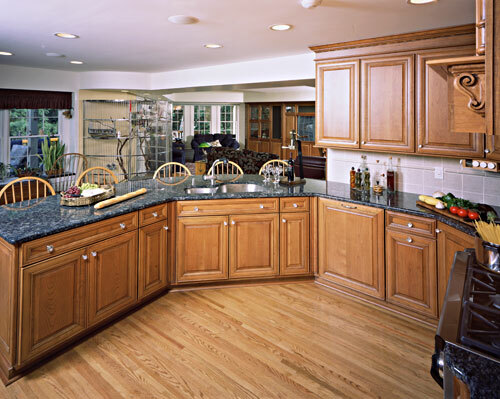 Jay Rambo cabinetry displays the custom design in this kitchen in Newtown, Pa. The idea of the wine cabinet inspired by the wine collector and designed to his needs. Decor range and oven for daily use, Blue Pearl Granite enhances the open look and seats diners morning, noon and night. Lighting by Task Lighting Company give charm to every corner. Custom designed Questech tile mosaic poses as a artful backdrop to the cooktop.